Since its inception in 1981, C & K Machine, Inc. has specialized in the design and manufacture of a wide variety of equipment types. One of the types of machines C & K manufactures produces a "hand-wrapped" look to many different products. Products such as candy, bearings, tape, bakery products and sandwiches are all wrapped on C & K's Wrap King ® line of specialized equipment. In addition to the Wrap King ®, C & K also manufacturers a line of crayon labeling equipment that is used around the world. Cartoning Equipment is also a specialty at C & K. Whether it’s the semi-automatic hand loaded Vertomax ® or the intermittent motion horizontal Automax ® Cartoner, C & K Machine has your cartoning needs covered. C & K also designs and manufacturers specialty equipment for the packaging industry. Throughout the years, C & K has design and produced feeding systems for flow wrappers, weighing systems and unique feeding systems for cartoners. 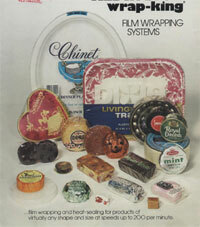 Wrap King ® brochure circa 1970 demonstrating the versatility and variety of product sizes and shapes. A Brooklyn New York Bakery circa 1960 with 5 Wrap Kings®.